The present invention relates to liquid sustained release suspension dosage forms comprising ionized forms of water-soluble drugs. 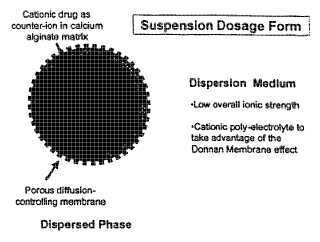 In particular, the invention encompasses a liquid form controlled release drug composition comprising a dispersed phase comprising an ion-exchange matrix drug complex comprising a pharmaceutically acceptable ion-exchange matrix and a water-soluble electrolytic drug associated with the ion-exchange matrix, wherein the surface charge of the ion-exchange matrix is opposite that of the electrolytic drug and a dispersion medium substantially free of diffusible counterions, further comprising a polyelectrolyte having the same charge as the electrolytic drug. The invention also provides methods for preparing such compositions and method of treatment.